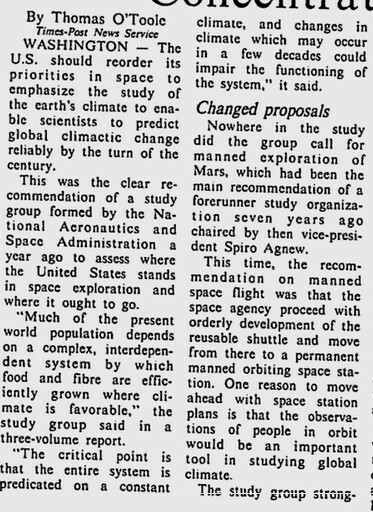 NASA lost the plot 35 years ago. Experts have warned that pollution could cause global temperatures to drop……..A one-degree drop would also trigger a $700 million increase in annual electrical energy demand……excluding the cost of treating a rise in skin cancers that could come from alterations in the earth’s atmospher. So NASA should be doing climate instead of space? I think we should be doing a lot more regarding space travel, but certainly the capabilities of satellite analysis of the earth are too important to ignore. I don’t see a need for a separate organization for each objective. We still don’t know enough and we’re still predicting………. Spiro Agnew? Another great name from the past. Spiro=Absolute O! GISS ignores satellite temperatures and uses corrupt surface stations data for its “global temperature”. Yet another inconvenient truth. I sure am glad the Earth is at its perfect temperature. According to the experts, one degree either way would be the end of civilization. We are adapted to the current climate. A rapid change in either direction could be disruptive. This is not hard to understand. If natural changes are occurring over which we have no control then we would need to plan ahead to adapt as best we can. If man made factors are causing global or regional climate changes then developing a balance of mitigation and adaptive measures is called for. I repeat, this is not hard to understand. HAHAHAHA! Mikey made another funny! Winter US mean temperature has dropped three degrees since 1998. It would be interesting to find out how much additional energy use was due to this. If the present record cold weather in the Northern Hemisphere is the result of Global Warming as some alarmists suggest. Temperatures in the Arctic region have been very high this winter. Isn’t that part of the Northern Hemisphere? HAHAHAHA!! Two funnies made by Mikey, you are on a roll this evening! It would be interesting to know who the authors of this NASA report were. Was climate alarmist/activist James E. Hansen of NASA involved? He had developed a computer program which was used to predict global cooling in the 70-ies, but he denies that he himself has advocated global cooling. That little newspaper clipping doesn’t even cite the title of the report, so how can we find out the author(s)? I remember the skies turning brownish along the Atlantic ocean horizon as I grew up in Florida. No one really liked it. It was ugly. Pollution was noticeable. The clear skies were gone. People were having recognizable problems with air over heavily polluted cities. Leaded gasoline fell out of favor along with CFCs. Then came a new cry, the evil of CO2 and global warming. Connecting the dots to these two were easy. However, science has advanced and we now know this is truly in error. CO2 really plays only a slight, almost entirely negligible role. We have discovered the real reasons behind climate change to be solar related, changes in the oceans, cloud cover, position of the planets and so on. We might be better off not worrying at this time about the climate and restore the land for farming and allow the fish to replenish the oceans. Take the greenhouse out of the sky and put more of them in the backyards. So make up your minds already? Will pollutions cause the earth to warm or cool? I guess their minds go wherever the money goes?